CHICAGO--(BUSINESS WIRE)-- Hyatt Place Charleston/Historic District and Hyatt House Charleston/Historic District, the first combined Hyatt Place and Hyatt House hotels and the first Hyatt Place and Hyatt House hotels located in downtown Charleston, open today. The hotels create an experience that enables guests to enjoy the benefits of both brands in one location. Hyatt Place Charleston/Historic District brings the Hyatt Place brand’s intuitive design, casual atmosphere, and practical amenities, such as free Wi-Fi and 24-hour food offerings, to the Charleston area. Hyatt House Charleston/Historic District provides guests with the spaces and places that help make them feel more like residents. Located in the heart of downtown, Hyatt Place Charleston/Historic District and Hyatt House Charleston/Historic District are located down the street from some of the city’s best restaurants, within walking distance of beautiful Marion Square and the Farmers Market as well as near the historic Charleston City Market. The H Market to meet the everyday needs of guests, from snacks and sundries to freshly prepared salads and sandwiches. 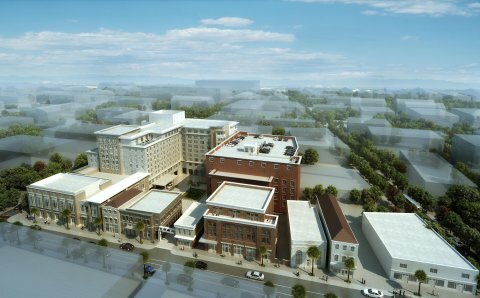 Hyatt Place Charleston/Historic District and Hyatt House Charleston/Historic District are under the leadership of General Manager Pedro Perez and Director of Sales Rachel Frost. In his role, Perez is directly responsible for managing the day-to-day operations of the hotel, including overseeing the hotel’s 80 associates and ensuring guests encounter the purposeful service for which Hyatt Place and Hyatt House are known. Frost is responsible for providing sales service and support to travelers and meeting planners frequenting the Charleston area. Hyatt Hotels Corporation, headquartered in Chicago, is a leading global hospitality company with a proud heritage of making guests feel more than welcome. Thousands of members of the Hyatt family strive to make a difference in the lives of the guests they encounter every day by providing authentic hospitality. The Company's subsidiaries develop, own, operate, manage, franchise, license or provide services to hotels, resorts, branded residences and vacation ownership properties, including under the Hyatt®, Park Hyatt®, Andaz®, Grand Hyatt®, Hyatt Centric™, Hyatt Regency®, Hyatt Place®, Hyatt House®, Hyatt Zilara™, Hyatt Ziva™, Hyatt Residences® and Hyatt Residence Club® brand names and have locations on six continents. As of June 30, 2015, the Company's worldwide portfolio consisted of 618 properties in 51 countries. For more information, please visit www.hyatt.com.